In October, Veterinarians for Animal Welfare in Zimbabwe, got a call from someone worried about a neighbor’s litter of puppies. They went to investigate and found three four-month old puppies in good shape. But a fourth puppy was lying listlessly on his side. He managed a tiny wag of his tail, but that was the best he could do. The owner of the puppies came out of the house and explained that she wanted to keep the three healthy puppies, but that she had no use for the little sick one. Sadly, the puppies’ mother had died giving birth. Sam, as he came to be called, was literally at death’s door. His little front legs were crooked, he was starving, and he could barely move. 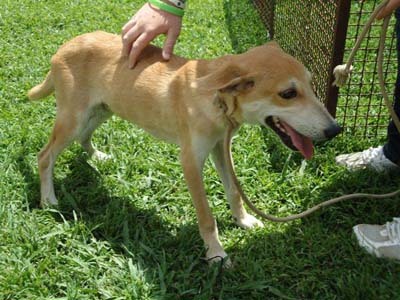 They took him straightway to the Chisipite Vets, where it was discovered that he had a serious medical condition as well. Thanks to the very dedicated treatment he received, he not only survived, but he now looks like a different pup altogether. His legs straightened out, his fur grew, and despite his sad beginning, “He loves everyone he meets.” Now healed, Sam is looking for his forever home. Meryl Harrison, Chief Animal Welfare Inspector, who never seems to stop, saves countless animals from cruelty cases. She gained a reputation a while back for intervening, with remarkable courage, during some of the farm invasions in Zimabawe to save the animals. Now she rescues donkeys and cows from cruelty, seeing to it that those who abuse animals are prosecuted. VAWZ saves a great many dogs that find themselves in really difficult situations. To read more about the work being done by this remarkable group, click here. Snow White goes home for Christmas! Snow White got adopted on Christmas day! Many such orphaned, roaming pups need a caring home, Instead of buying a foreign breed, adopt an animal from our rescue center! The care fact sheet and vaccination will be provided by PAWS! Don’t buy while homeless animals die! Call PAWS at 9820161114 for further information. Wishing all a Merry Christmas and all animals in your care a happy and safe holiday! 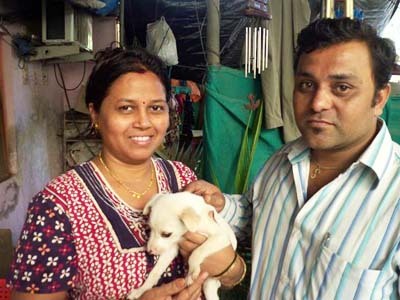 PAWS is located in Mumbai, India. 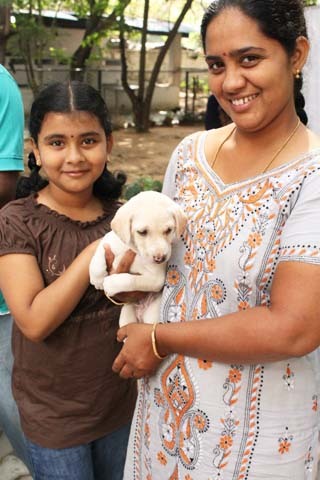 This all-Indian puppy — we believe he’s been given the name, Knight — about to go home with his delighted family — was one of many adopted at the most recent adoption event of Blue Cross of India, in Chennai, this past Sunday, December 11th. To visit the Facebook page of Blue Cross of India, click here. 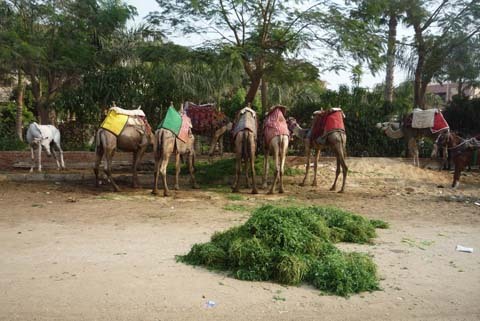 The Egyptian Society of Animal Friends in Cairo, Egypt, continues to provide treatment and feeding seven days a week for the horses, camels and donkeys at the Pyramids. Because of the scarcity of tourists since the protests began early in 2011, the animals have been relying on help from ESAF and other groups for feed and vet care, since without income, their owners cannot care for them adequately. From November 26 – December 12, ESAF fed 914 animals and gave vet care to 493. 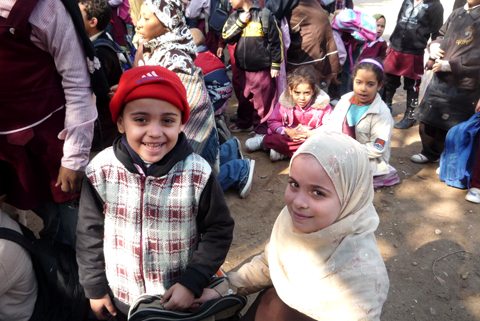 “As part of our educational program and part of the long term plan, ESAF in cooperation with Giza vet department made the first school visit at Abu El Hool (Sphinx) elementary school where the children, were instructed in the correct care of horses and camels and general animal welfare. A Donkey was used as part of the program; the children were very happy and attentive.” Ahmed El Sherbiny, Chairman of ESAF. In the new year ESAF will be taking this program to six more schools. The University Grants Commission, New Delhi has issued official Guidelines for phasing out dissection and animal experimentation in Life Sciences studies in Indian colleges and universities. The Guidelines state that dissection has been part of the curriculum in India for 90 years, but that now many technologies are available that make dissection outmoded. In the past, there were fewer colleges and fewer students, so fewer animals were used. Now nearly a million students are enrolled in courses requiring dissection. The animals used, for the most part, are wild-caught, and this means that they are being removed from their natural habitats, disrupting biodiversity and the ecological balance. Dissection is now a factor, along with pollution, loss of habitat, and climate change in depleting wildlife populations – especially endangered and threatened species. The decline in the frog population has reached alarming proportions – and frogs, as we know, are declining worldwide. These recommendations in the Guidelines, both short-term and long-term, are intended to be a roadmap for revamping the curricula of science courses. They have been approved by the University Grants Commission and the Ministry of Human Resource Development. 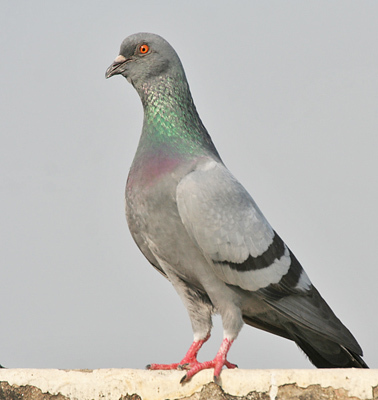 All university and college courses relating to animals will fall under these Guidelines. Here are some of the highlights, paraphrased, contained in the Guidelines. The Prevention of Cruelty to Animals Act, 1960, requires that animal experiments be replaced, wherever possible, with suitable alternatives. It also stipulates that animal dissection should not be used for the purpose of improving manual skills. 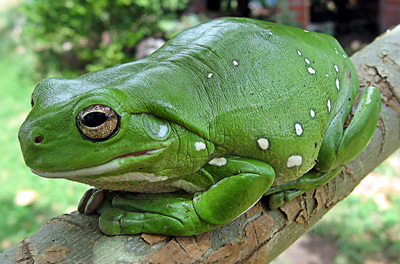 The Wildlife Protection Act, 1972, protects all sharks and rays and all frogs of the genus Rana, which, generally speaking, means true frogs – not toads or other frog-like species. Universities will now also be required to include a course on “animal ethics”. Excerpts of these two laws are to be posted in laboratories and classrooms. Every educational institution will have to set up a Dissection Monitoring Committee to review the use of animals in dissection, within the framework of the Guidelines, to ensure that animals are acquired from ethical sources, not from the wild, and that they are transported without experiencing stress or strain – or, if they are to be dissected, that they are anesthetized humanely. Good records must be kept. Numbers of animals used in experiments shall be reduced, and insofar as possible, must be obtained from breeders, approved by the CPCSEA. The idea behind this is not to imply that animals bred for laboratory use suffer less than wild animals; it is rather to regulate the use of animals with a view to phasing out animal experimentation in schools altogether. Only one species will be used for demonstration by instructors. Students will learn by observing and recording, not by performing dissections themselves. It is suggested that instead of dissections, alternatives be used, such as pre-existing museum specimens, or photos, videos, models, charts, and field observations. In this way the animals can be studied without harming them. Field trips may be taken on the college campus and nearby habitats to familiarize students with local fauna. When students go on field trips, they will only observe and record the animals –which will not be killed or removed from their natural habitat. The students will be told about conservation and biodiversity. While undergraduate students will not normally do dissections; graduate students will be given a choice to perform dissection or to do a project related to biodiversity. If the students do choose dissection, they will use only selected species, perhaps one invertebrate and one vertebrate species. Computer simulation will be encouraged. Students who opt for carrying out a project rather than doing dissection will be assisted with all necessary computer and digital tools and/or field trips and will be tested in an appropriate way. Three to five day workshops will be held, with the help of organizations experienced in the field, to train teachers in the many computer-based alternate methods now available to replace the use of animals. New software specifically geared to India will be developed and offered at no cost to universities. Evolution, population dynamics and biodiversity will be emphasized in Life Science courses. The University Grants Commission will develop a model curriculum to serve as an example. This transition to using alternatives — computer programs and other modern technology to replace the dissection of animals will save the lives of millions of animals who would otherwise suffer. This major step sets an example for other nations to follow. At a time when the natural world is under profound attack from a number of man-made causes, this is a very promising breakthrough. We look forward to its speedy implementation and to the day when no animals – either bred – or wild-caught – will be used either for dissection or in any experiments. 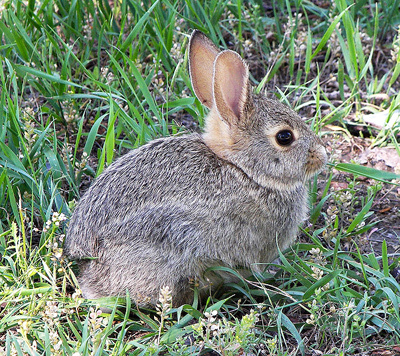 A Cottontail in Montana, U.S. When we as humans can relate to the natural world with respect and appreciation, it will be a brighter day for all of us. For 42 years the CPCSEA (Committee for the Purpose of Control and Supervision of Experiments on Animals) has been fighting for the elimination of testing on animals and dissection in schools. Schools and universities are a good place to start phasing out the use of lab animals since they set the norms that students will adhere to in their future careers, and also one can make the clear point that dissection in schools is repetitive and unnecessary. In 1968, the CPCSEA first put forward many of the recommendations that have just been issued in the Guidelines. They have worked hard since that time to have these measures officially adopted. Dr. Chinny Krishna, who has served for many years on the Board of the CPCSEA, says, “These guidelines are the culmination of the efforts of Mrs. Maneka Gandhi who was Chairman of the CPCSEA from 1996 to 2002. Even earlier, there were attempts by People for Animals to discourage dissection and much earlier, starting in 1964, by the Blue Cross of India and the Bombay Humanitarian League. After giving up the Chair at the CPCSEA, Mrs. Gandhi kept after the UGC to stop dissection and, about three years ago, got a team consisting of Dr. Shiranee Periera, Dr. Sultan Ismail and myself to draw up a proposal towards this. The UGS guidelines are a result of one person’s dogged follow up, and Maneka Gandhi deserves full credit for this remarkable achievement”. In 1987, the Blue Cross of India brought out its first interactive dissection software, COMPUFROG, followed by five more on the rat, pigeon, cockroach, rabbit and worm. The dynamic and effective group, Interniche, headed by Nick Jukes, which is active worldwide, has done very remarkable work in recent years to promote the use of alternatives to animal use in experimentation and dissection. The Blue Cross’ software finds mention in the list prepared by Interniche in their first book “From Guinea Pig to Computer Mouse”. To make a special donation to Blue Cross of India – through the program Global Giving — to get 500 animals spayed/neutered, click here. Blue Cross must get at least 50 donors through this program before December 31, so donating even a small amount will help a lot!